On May, 22, 1912, a caravan of horse-drawn carriages carried nearly 50 very sick Duluthians from downtown to a place called Nopeming, ten miles southwest of the Zenith City in the middle of the woods. No paved roads led to the facility, though a path had been recently cleared for construction crews. The carriage passengers were carriers of pulmonary tuberculosis, and the first patients of a new hospital—one at the end of a muddy path that they knew they might not travel on again. County tuberculosis sanatoria—as well as state hospitals for the insane, city homes for elderly, etc.—became common after the turn of the twentieth century. A disease or class of disorders called for a building of a certain architectural style located in a setting usually far from the central population. These criteria were usually dictated by a certain influential personality or voted on at large medical conferences. The creation of Nopeming—the first county TB hospital in Minnesota—was a combination of both. 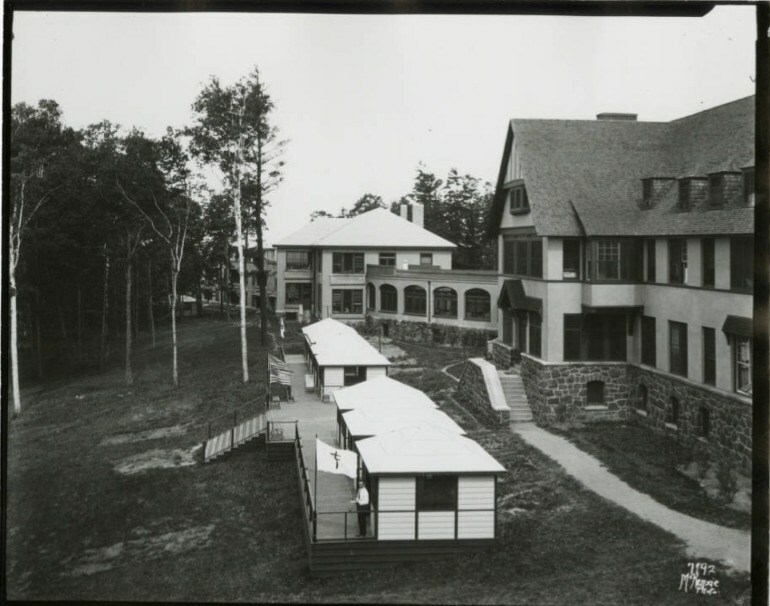 The idea for a Duluth tuberculosis (TB) hospital arrived in Duluth in 1908, carried by one prominent local doctor who attended the International Conference of Tuberculosis in Chicago, notably presided over by President Roosevelt. Sharing the spotlight with the president was Dr. Edward Trudeau, now considered the grandfather of the tuberculosis hospital movement. The audience included Dr. Edward L. Tuohy of Duluth’s St. Mary’s hospital, who had in years prior established a major medical laboratory at his home institution and developed a reputation in the city as a major public health advocate. The conference convinced Tuohy that his city deserved a world-class sanatorium to treat its infected denizens, an idea he lobbied for when he returned to the Northland. “SPOT LIGHT ON WHITE PLAGUE,” read the headline in August 1908 that detailed an upcoming exhibition. “The anti-tuberculosis movement is now world-wide,” wrote Tuohy and his colleagues in a statement, “and we in this city cannot afford to lose the advantage of it.” The exhibit would go on to Washington D.C. as Minnesota’s representative display. Later that year, the Duluth Anti-Tuberculosis Committee was formed, inspired and led by Tuohy. The organization’s first mission was to convince the state legislature to authorize the construction of a hospital. In February 1909, Dr. Tuohy left St. Mary’s Hospital for the state capitol to deliver this argument on behalf of St. Louis County and the City of Duluth. Interestingly, it was originally thought that the county had the right to build such a structure out of its own volition. But when the town of Eveleth tried to build a TB hospital of its own, the effort was blocked. If Duluth wanted to accomplish its goal, it would need to get the go-ahead from the state body. Dr. Tuohy worked with city attorney William Stevenson to author a bill. The document came in the wake of a city wide petition, inspired by an Anti-Tuberculosis Committee circular that read in part, “Last year there were 173 deaths from tuberculosis in the county…looking ahead a few years there will soon be 200 deaths,” and went on to make a case for a 100-bed hospital. All of these efforts proved successful, and the state legislature agreed with Duluth about the need for a hospital. The state authorized $20,000 for the project—about enough to erect one small building, but not enough to break ground on a 100-bed hospital, the initial goal. Nonetheless, the legislative nod kicked off local fundraising. The city decided it would construct the first county sanatorium in the state, and with the state’s approval, it was simply a matter of funding. While money was being collected, Dr. William Hart (a friend of Dr. Edward Tuohy and fellow TB activist) treated patients at the St. Louis County Courthouse and wrote pieces for the Duluth News Tribune to energize the public to the cause. His article entitled “The Fight Against Tuberculosis” in particular detailed the ways the disease spreads between humans and animals, and offered modern tactics to limit transmission. Photographs ran with the article showing how other various institutions had been organized, educating a public that awaited its own sanatorium. After several other sites were disqualified, the Sanatorium Commission arrived at a site that today rests just east of I-35 where the highway intersects with Midway Road—though no such markers existed in 1912. 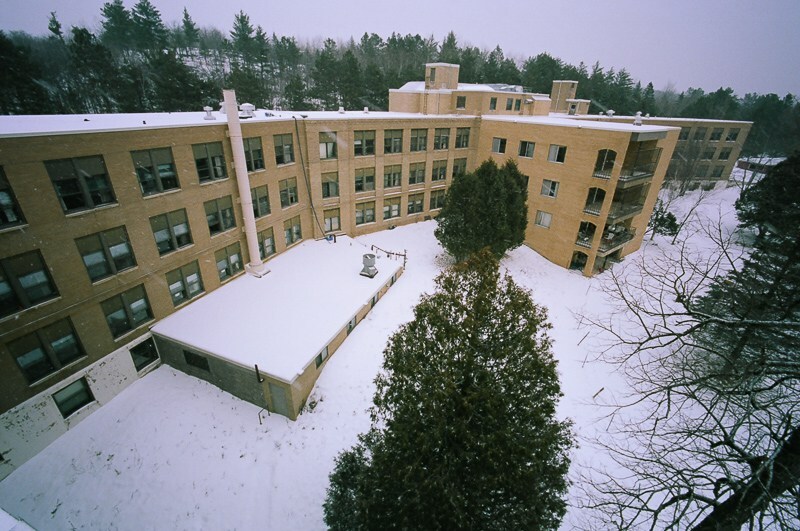 The doctors liked what they found there, and proclaimed it as the most ideal location for a sanatorium in the state—far superior to the site in Walker, Minnesota, where the state TB hospital was located. After securing the property, the commission pronounced it the most ideal location for a sanatorium in the state. The site took up 80 acres adjacent to the Northern Pacific and Canadian Northern rail lines—good for cutting construction costs. The doctors even analyzed the shape of the surrounding hills and concluded that the airflow around the site was perfectly suited for TB patients. Keep in mind that at this time, practically every structure was heated by burning wood, coal, or coke to create steam. The city, as an industrial boomtown, labored under a layer of soot belched from a thousand chimneys and a hundred ships. Flour mills, sawmills, and metal manufacturers lined both sides of the St. Louis River, all powered by coal—and that was before US Steel erected its giant facility at Morgan Park. Obviously, TB patients needed some insulation from the pollution typical of their time. Nopeming was far from the city’s industrial center, far from belching smokestacks. On April 19, 1911, bidding for construction began and the curious task of naming the institution surfaced. The Sanatorium Commission recognized the possibility of patient stigmatization compelled to stay at an explicitly public TB hospital, ruling out the predictable “St. Louis County Sanatorium” or something similar. Instead, a city-wide naming contest was held. The name was suggested by Rev. Frank Piquette, who spent most of his life as a missionary to the Ojibwe (also called “Chippewa”) but at that time served as minister at Methodist Episcopal Church in Sawyer. “Nopeming” won not only because of the geographical appropriateness, but because the land had long been a hunting ground for the local Ojibwe bands. The word itself also struck the commission as romantic and reminiscent of the poem “The Song of Hiawatha” by Longfellow. Construction began in 1911 on the first building—the basement was set that August. While the first building was mostly financed by the initial state investment, money for the second building—designed for the treatment of infected children—came largely by donation. By 1912 the Committee raised $10,000 from the citizens of Duluth for the construction of such a facility. The main building would be called Hart House, after the man who would be the hospital’s first superintendent. Nearby the Children’s Cottage doubled as an “open air school.” This meant that its second floor walls featured large hinged sections, allowing them to be opened to the elements during the day. At the time physicians believed that the best way for a TB patient to recover was to breathe clean, cold air. When those first patients arrived in May, they found two buildings that were not quite ready for them—while St. Louis County’s new sanatorium had plenty of fresh air, it did not have as many rooms as it had patients.